This page explains the processes that we follow when electing our Directors, and Officers in the forthcoming Transition Tynedale Ltd AGM, to be held on Wednesday 2nd December, 2015 at Scott’s Café, Forum Cinema, Hexham. Prior to the AGM, registration will start at 7.00 pm to be completed by 7.30 pm. Members registering at the time or by email should pay at the AGM registration the sum of £5.00 to establish the rights to vote by receiving a voting slip. Electric Bikes have now arrived in Hexham! Green Energy Cycles, a sub division of The Centre for Green Energy, has recently opened in July offering alternative transport systems to the Tyne Valley. An electric bike is similar to a push bike yet has an electric motor and battery attached which helps push you along (for up to 200km on one charge). These bikes allow steep hills to be tackled with ease, trailers to be pulled and headwinds to be tackled, with a range of bikes from city cruisers to mountain monsters. Even those who currently love their pushbike may be suited to them; one can take various perspectives when assessing them. Some would say ‘that’s for lazy riders’ others understand that instead of X effort getting you 5 miles of travel, X effort with an e-bike could get you 35 miles, for example. Green Energy Cycles stock Go Cycle, KTM and Raleigh bikes so far and are offering free test rides and hires to the public. 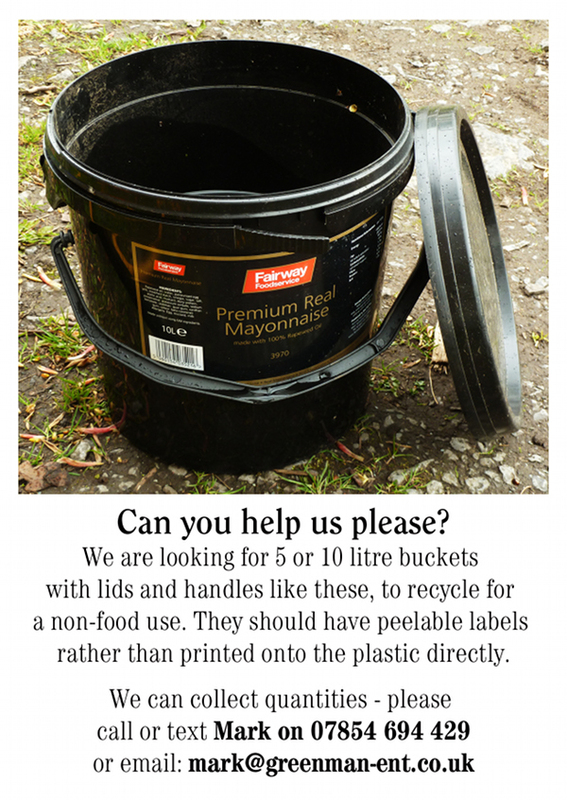 If you are interested, please pop along to the showroom on Anick Road – and you will be able to have a go. They really are great fun! The 2015 TT Planning Meeting is on Sunday afternoon, 26th April 2015 at the Forum Cinema, Hexham. 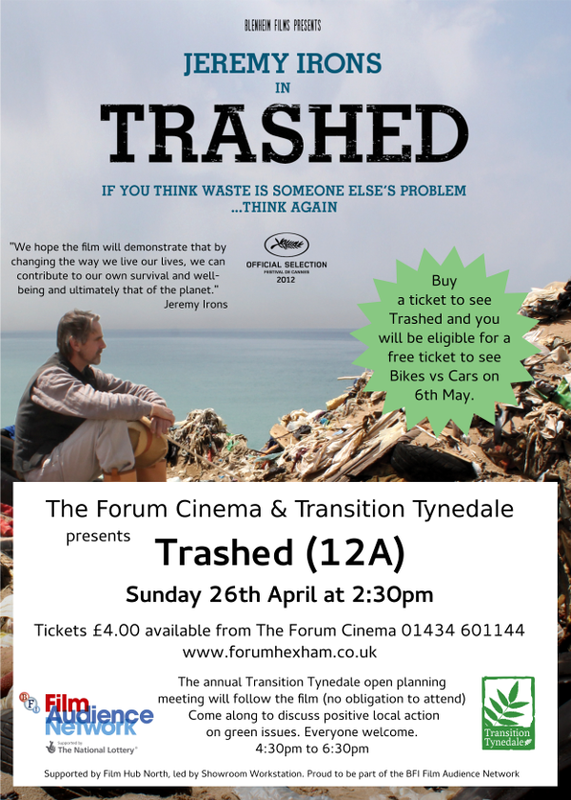 We have arranged for a special Our Screen showing of the award winning film Trashed, starring Jeremy Irons. The film will start at 2:30pm and runs for 98 minutes. At 4:30pm, we will hold our planning meeting in the cinema, full of inspiration to make some positive change! The planning meeting will finish at 6:30pm. Tickets to the film cost just £4.00. What’s more, if you buy a ticket to see Trashed, you will be eligible for a free ticket to see Bike vs Cars on 6th May (see below). Remember to ask for the free ticket when booking so The Forum can keep track of sales. The aim of the meeting is to raise awareness of Transition Tynedale and to plan what we want to do in the coming year. 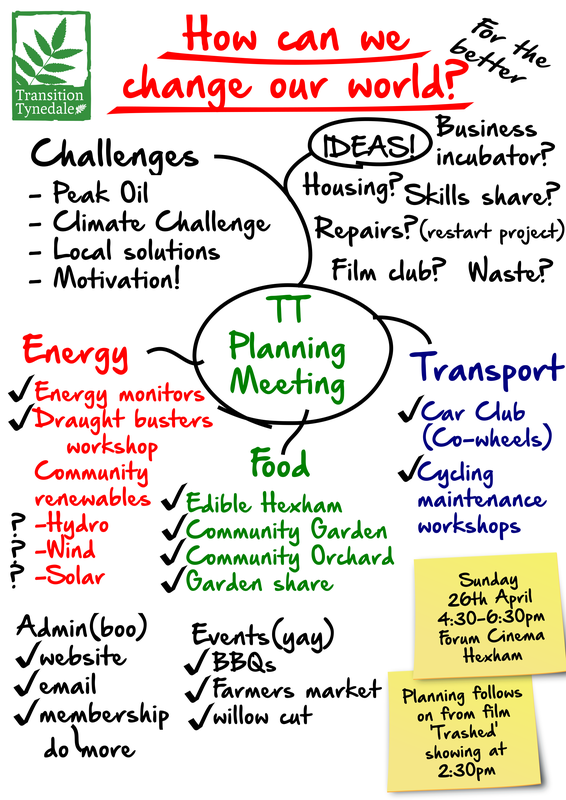 If you have an idea for how Tynedale residents can adapt to a low carbon future, then get in touch and come along. We currently have the following themes and projects, but don’t be constrained. If you have an idea you want to pursue, then come and make it happen. The Energy Group are hosting a series draft busting workshops offering practical advice and support in reducing carbon emissions in the home. Members have been discussing whether to actively support the Restart Project in the coming year. The Transport Group have just had a great year in which they successfully launched the Co-Wheels car club in Hexham. Richard has offered to host another of his popular bicycle maintenance workshops, Love Your Bike. The Food Group was very active last year, with the fantastic Edible Hexham project transforming neglected corners of the town into attractive and bountiful beds full of edible plants. The Hexham Middle School Community Garden is growing from strength to strength with the taming of weed patch/jungle into vegetable and fruit beds, restoration of the store room, creation of a willow den and generally making the garden a beautiful refuge for all. There has been some debate recently within Transition Tynedale about how members should publicise a political party that they support and whether Transition Tynedale as a whole should align with one single party. publish interviews with, and articles by, party spokespeople. subject politicians, their policies and opinions to critical appraisal guided by our principles and focusing always on the changes we want to see in the world. Whether your Hub or individual initiative’s position should be exactly the same or not is up to you, but hopefully the above will be a useful starter for your discussions. There is general agreement within TT that as we are not a party political organisation, we should not align to any one party as a group. Transition Tynedale should be seen as a place where people of any political persuasion can find acceptance and support in pursuit of our shared aims and objectives. We certainly do not wish to alienate any existing or potential members. This does not mean that individual members shouldn’t continue their hard work in support of their chosen party. Furthermore, the TT website and blog should be a place where good news within the mainstream political arena can be shared. But it is important that all posts make it very clear that activities external to TT, are not endorsed by the wider membership of Transition Tynedale. Provide links to the external website that is the original source of the information instead of re-blogging/cutting and pasting. Use the ‘blockquote’ feature when quoting external sources. I have used this above when quoting Rob Hopkins. If news is being reported first hand and relates to a non-TT activity, please make this clear; explicitly state that any views are held personally or by the organisation being described. This can be as simple as using the pronouns ‘I’ and ‘my’ in place of the more ambiguous ‘we’ and ‘our’. I hope that covers most of the points on this particular debate, but if you have any comments, please feel free to add them below or contact me via the TT email address. The Newcastle Cycling Campaign are organising a ride on 25 April in support of CTC’s Space for Cycling & Vote Bike campaigns. You can find the details on the CTC Events page. Jeremy Irons sets out to discover the extent and effects of the global waste problem, as he travels around the world to beautiful destinations tainted by pollution. This is a meticulous, brave investigative journey that takes Irons (and us) from scepticism to sorrow and from horror to hope. The film will start at 2:30pm and runs for 98 minutes. At 4:30pm, we will hold our planning meeting in the cinema, full of inspiration to make some positive change! The planning meeting will finish at 6:30pm. This workshop was a joint venture between TT Energy group, No 28 and Warm Up North and held on Saturday 18 October. 4 people attended, all residents of the east end or town centre. We started off at No 28 with a discussion on top tips for reducing draughts whilst waiting for the trainer to arrive. Once the trainer had arrived we then moved onto one of the attendee’s home and the trainer used the draught busting demonstration kit (provided by the Centre for Sustainable Energy) to explain how to use each item, with some tricks of the trade thrown in, as well as improve the homeowner’s draughty kitchen window. Although things didn’t go quite according to plan all the participants enjoyed the workshop and found it useful. They were also pleased with the money off voucher kindly provided by Homebase. Lastly, we have identified a host for the next one. On a sour note, we were rather badly let down by Warm Up North at the last minute, as they were supposed to be providing £20 worth of free insulation products per attendee. On the day before the workshop WUN said they weren’t going to provide the resources. Luckily, after a last minute visit to the store, Homebase agreed to offer all workshop attendees a voucher for 20% off all insulation products. WUN hadn’t briefed the trainer properly either and he turned up 30 mins late expecting to insulate a house rather than run a workshop. Once he had arrived he was excellent. Next time we’ll cut out WUN and just deal with the trainer direct!